If you would prefer to read this blog post as a single pdf file, click here. In thinking back over the past few decades I could not help but notice that years ending in “2” seemed to have a lot of significance for sustainability. 1962 was the year of Rachel Carson’s Silent Spring. 1992 was the year of the Rio Earth Summit and the Declaration of the 27 principles on Environment and Development – it was also the year of the Scientists Warning to Humanity. And then there was 1972, the year of the Limits to Growth. * “…the US and Canada have no real energy strategy” (slide 107). These are but a few of many important details and insights in Hughes’ presentation. I would like to focus on two of his points to raise a couple of questions for possible discussion on this blog. To see if Heinberg was overly pessimistic up to now, I looked up the currently available data on US installed windpower as of 2011. This (probably authoritative) source gives a figure of 0.92 quads or about 5% of the 18 quads Heinberg thinks wind could eventually generate. Overall energy use in the US in 2010 however, was about 98 quads. Seems like we have a lot of wind turbines to install and not much time to do it in? 2. When I got home from Hughes’ talk, I ran over to the bookshelf and pulled down my copy of Limits to Growth: The 30-Year Update published in 2004. 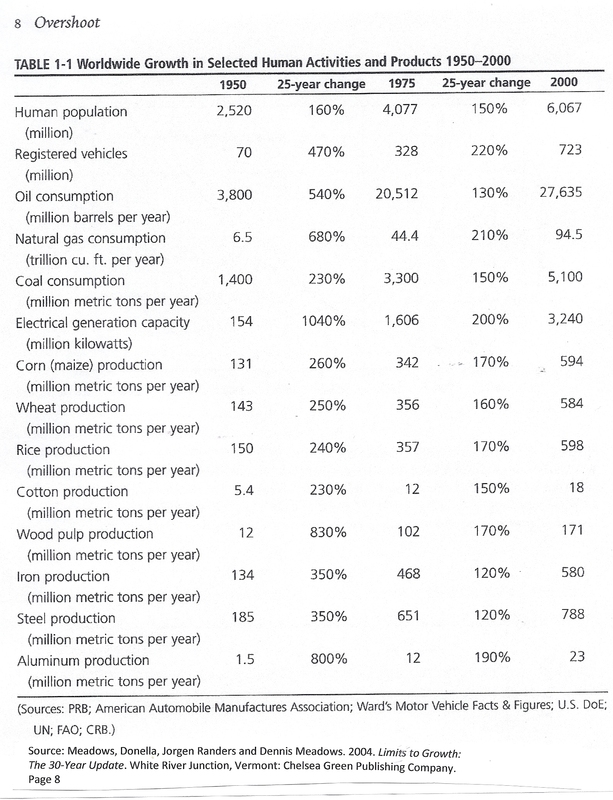 There’s a lot of interesting (and scary) info in this book, but Hughes’ talk led me to page 8, in the chapter on “Overshoot.” There was Table 1-1: Worldwide Growth in Selected Human Activities and Products 1950 — 2000. Hughes had made many of his charts run from 1850 to the present or from 1850 to 2030. This gave an impression of ever-increasing rates of production and use. But authors Meadows, Randers and Meadows of LtG contrasted the rates of increase between 1950 and 1975 with the rates between 1975 and 2000. In other words, two sets of rates for two consecutive 25-year periods. You can see a jpeg of this one page with the reference by clicking here. Or, type in: http://msuweb.montclair.edu/~franker/LimitstoGrowth30yrupdatepage08.jpg . Or, try to view it here on the right hand side. This table compares 14 human activities on these two contrasting time periods. And – in every single case, the rate of increase from 1975 to 2000 is slower – often much slower – than the rate had been from 1950 to 1975. A few examples: between 1950 and 2000 human population rose 160% while from 1975 to 2000 it rose 150%. This is the only one that’s a bit close. For rice production, it was 240% vs 170%; for registered vehicles 470% vs 220%; for oil consumption 540% vs 130%; for aluminum production 800% vs 190%; for electrical generation capacity 1,040% vs 200%. Now, in peak oil theory (and peak anything by extension), the production, the production curve goes up steeply, tapers off to a sort of horizontal moment and then curves sharply downwards. To see the standard Hubbert peak oil curve from the Wikipedia entry on Hubbert Peak Theory, click here. You can view the blue-green-orange one as copied here into the blog post or the red line one several lines below under “Hubbert Curve;” they both have the same shape. If you mentally trace a line from the bottom left up to the top of the curve in about the middle, you can see that the line goes up less and less and veers more and more towards horizontal before slipping over the top and starting the sharp descent. This struck me as interesting because the data from LtG: The 30-Year Update seem to show exactly that: a slowing of a rate of increase. Now, what if this turns out to be true? What if we are on a Hubbert-like peak curve just approaching the top? What are the implications? Given that we live in an economy mostly dependent on growth for improving the standard of living, such a set of slowdowns would almost have to result in an overall economic downturn. And notice that the data in LtG + 30 do not include the 2008 recession – the precede it. Is it possible that our location on a Hubbert Curve played a role in the current downturn – and if so, what does this tell us about where we should go to deal with the downturn? The two alternatives offered by those with access to the mass media are: austerity and budget cuts by the right wing and Keynesian style government growth stimulation by the liberal wing of the Democrats (e.g. Paul Krugman). But is either of these alternatives realistic if we are slowing down as a result of approaching peaks in several key resources needed for industrial growth? And if so, what other alternatives should we consider? J. David Hughes bothered me a lot with his presentation. Not because it was weak or disorganized but because it was so convincing. But after I went home and thought about the connection with page 8 in Limits to Growth: The 30-Year Update, I began to think we need some new ideas. Let us on the ST blog know if you have any, or any other types of comments and responses as well. Many thanks in advance. There is a whole field of theoretical research on sustainable economics, that I know almost nothing about. Steady-state economics is one variant. Once financial growth stops, some of the basic mechanisms that drive our current economy, such as interest on loans and exponential return on investments, start to fail. (hmm… sound familiar?) But I don’t know much about the proposed alternatives. I believe all of them involve financial hardship, at least during energy descent, but how that hardship is distributed depends on the social structures we create. Are you familiar with the Hirsch Report on energy descent, http://www.nyswda.org/LegPosition/HirschReport.htm ? If I remember right, it was commissioned by Bill Clinton from a government think tank, published just before he stepped down, and ignored by his successor. It doesn’t talk about alternative economics, that I recall, but it provides a detailed forecast of what happens to the economy after peak oil. I personally believe the U.S. economy has been post-peak and going downhill since 1971, when domestic oil production peaked, and the reason we haven’t realized it yet is that Reaganomics and its successor policies have turned to auto-cannibalism to disguise the fact that the economy is caving in. Wages have been stagnant for decades, benefit plans and safety nets have been gutted, worker protections have been relaxed, environmental protections have been relaxed, manufacturing has been relocated to the third world to save money, trade deficits are growing, both national and per capita debt have skyrocketed, we’ve turned increasingly toward violence to maintain preferential access to foreign oil supplies, taxes have been lowered, standards for lending have been lowered, predatory financial practices have become the norm, etc. etc. etc. We’re now approaching the point where there’s nothing left to gut, and it’s no longer possible to hide the downturn. I suspect we’re now past global peak oil as well. If we weren’t, we wouldn’t be rushing to develop marginal sources like deep water wells and tar sands. I don’t know whether there’s an indicator that would show it yet, since I don’t know whether production figures are corrected for the EROEI the way the Hubbert Curve is. I think we could find a better way of describing the EROEI, that would make it more intuitive. The simplest related concept I can think of is when a car is totaled, which means it costs more to fix than it’s worth. The absolute limit for energy extraction is much like that — it happens when the resource is totaled. I agree that we are looking at a rough and challenging transition, though we may point to a few things that will help buffer the changes. One is energy conservation and efficiency measures. That’s already done a lot to slow the rate of demand increase, and there’s a huge untapped reservoir of buffering if we were to get a lot more serious about it. Of course, the problem is that we still don’t take it seriously despite the benefits it would bring (compare the tax incentives for renewables to those for efficiency). Another huge and untapped buffering agent is the kind of strong community that shares resources and relocalizes its economy. People are taking more steps in this direction on their own, but good works in this area can be knocked aside by the actions of big corporations and their government backers (i.e. fracking in small communities that destroys local tourism/agriculture/wine economy). And as happenstance would have it, the very next article I read tonight is from Gar Alperowitz about the expanding New Economy movement with its deep emphasis on shared ownership and control and a redesign of our political and economic system. Are you aware of anyone who has applied Hubbert’s Curve to Ecological Footprint? I have, a couple of different ways, and I’d like to talk to someone about the results. Peak usable fossil energy (eg, production x efficiency) = within a decade of 2060, one side or the other. These don’t all agree with expert opinions, in part due to my lack of access to good data. This is my best guess on a world-wide basis, assuming that there are no significant changes in the way things are done, using the data available. By 2020, there won’t be enough soil left on the planet to feed the planet. By 2017 there won’t be any commercial oceanic fisheries remaining. Be able to provide your own food by 2020. Stop consuming imported energy before Peak Gas. Invest in Self, then Family, then Community, then finally the Open Market. The US is currently consuming an ecological footprint that is twice the size of their country. That means they are either extracting resources from the future, or from ‘Away’, and in either case, these will become unavailable at some point, and there will be a significant impact on how much time it takes Americans to meet their needs. Massive Human Development is required, but the US has a habit of using Technological Development to solve social challenges, which won’t help in an over-capacity world. Without that H.D., the extra time cost will mean that many people won’t be able to take the time to get higher education, or take early retirement, or be unemployed. Disparity will increase (as the poor bear a disproportionate share of the time burden) and class conflict will increase. Debt financing is dangerous. It burdens the future with our expenses, which we are using to purchase resources from the future, and won’t be available when the bill comes due. So, our future selves will borrow from a farther future, until at some point the last tree is cut down, the last cod is caught, and the last creek is polluted, and then no-one will be paying their bill. It’s a great Ponzi scheme, with our future selves holding the empty bag at the end. That’s not to say that all debt is bad – you can borrow to make yourself more sustainable, but only if you a) know what that really means and b) can show that the extra breathing room you’ve given yourself doing that can be used to pay off the debt. In the US, that’s hard. Economists predict the future, and are really bad at it. Engineers predict a future, and are really good at it. Heisenberg’s Uncertainty Principal says Magnitude or Timing – pick one. Engineers focus on ‘Magnitude’.